If you are looking for a reputable commercial construction company in Twin Falls, ID, Don Anderson Construction is the reliable commercial builder you can trust. Don Anderson of Don Anderson Construction has been in the commercial construction industry for over 35 years and has a portfolio that is sure to impress. Don Anderson Construction has earned a solid reputation as a reliable commercial construction company throughout the Twin Falls, ID, area. Keeping their core values of quality, value, and integrity in mind, Don Anderson Construction works to make every project a success by taking the steps to do it right. Don Anderson Construction has been family owned and operated for over 35 years, and has first-hand experience in every aspect specialized industrial construction. Don Anderson Construction has been working as one of the leading commercial construction companies in Twin Falls, ID, for the last 35 years. With every job, Don Anderson Construction demonstrates that repeat business is their priority, and thus it is their goal to surpass your expectations on the initial project. For a quality commercial construction company that cares, call Don Anderson Construction today! Don Anderson Construction is a locally owned and operated construction company based out of Twin Falls, ID. Specializing in various industrial construction projects, Don Anderson Construction's work can be seen throughout Twin Falls - including the Boise Broncos store, Aeropostal, Jimmy Johns, and many other structures. Don Anderson has been working in the construction industry for the past 35 years. By offering a wide variety of commercial work, Don Anderson Construction has quickly become a go-to commercial builder for the Twin Falls area. With experience handling many different types of projects, including tenant improvement for mall retailers and a larger scale research and development lab for Glandia, Don Anderson Construction has the skill set and acumen to handle any commercial construction project you need completed. 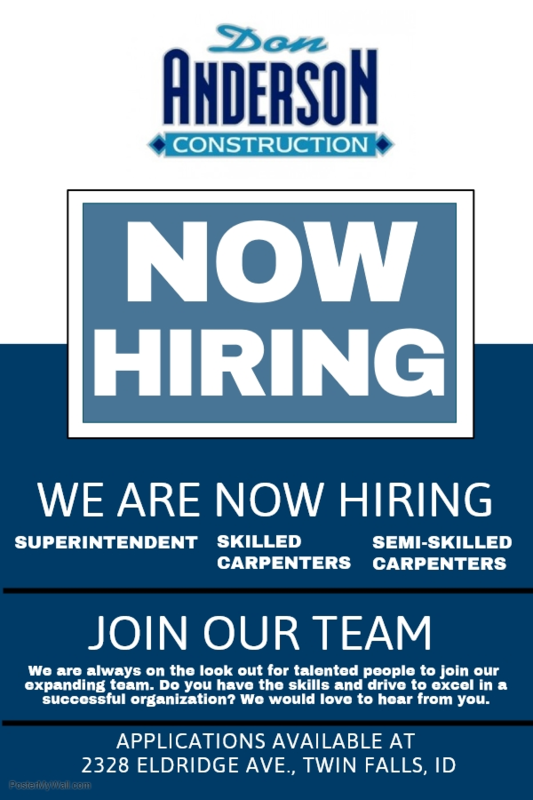 If you are looking for a professional commercial construction company, licensed and bonded, with experience building restaurants, office spaces, churches, and more, call Don Anderson Construction today at (208) 734-2164. Copyright © 2019 Don Anderson Construction, all rights reserved.